One thing that sets ProSmoke apart from the competition is the fact that they are the only company in the industry that is a Certified American Green Business, a recognition granted by the Green Business Bureau. This distinction means that ProSmoke is an environmentally friendly and socially responsible company that works towards achieving a minimum impact in the environment, as well as implementing practices that contribute towards a better society. Proof of this commitment is their monthly program of donations to a number of charities that work towards finding a cure for cancer. While these credential are impressive and say a lot about the kind of company that ProSmoke is, in the end, users are also looking for a satisfying product. 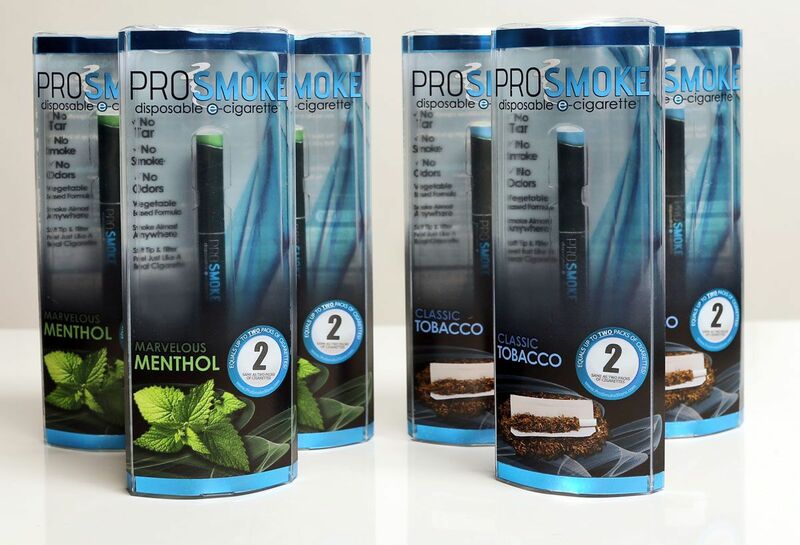 Even though there is some room for improvement in terms of the quality of the product, ProSmoke offers a good amount of vapour and a convenient price. 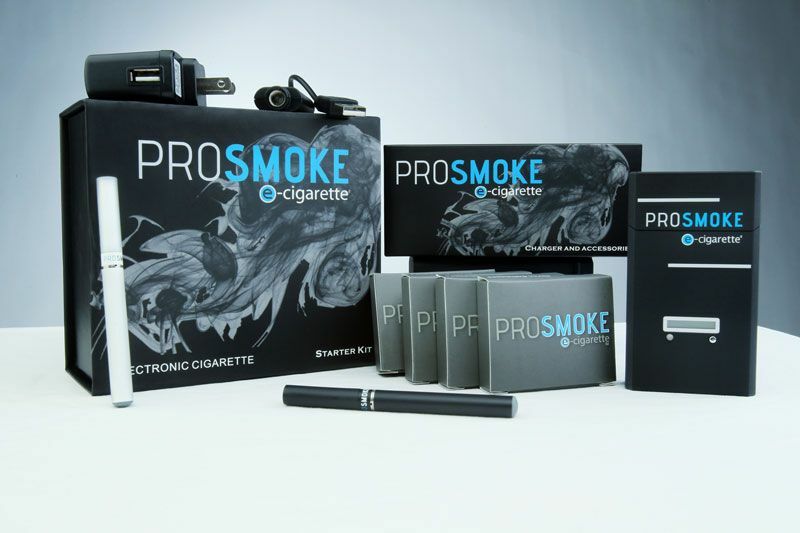 Pro Smoke is a the only Certified American Green Business e-cig brand on the market right now, striking a chord with eco-friendly customers who want to make sure their vaping is not adding to the footprint, but all that aside, they also offer a decent and pleasant e-cigarette. 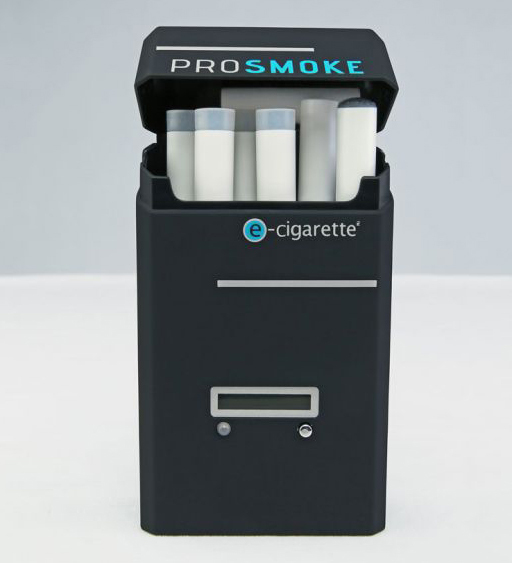 ProSmoke’s presentation caught the attention thanks to its solid design that portray technology and innovation, as well as top of the line in-house manufacturing. Unlike the majority of their competitors, who have opted for a two piece system, their devices work with the three piece model (battery, atomizer and cartridge) and even though that may put off some users that prefer the simplicity of using only two parts, ProSmoke e-cigs are easy to use. The atomizer stands out thanks to its long lasting design and self-cleaning technology. The ProSmoke electronic cigarette is designed to have the same length as a traditional regular size cigarette to mimic the same feeling. Offered in all white or all black the tip lights in a bright blue. ProSmoke’s developed one of the best atomizers on the market today. Rated to last anywhere from 75,000 to 150,00 puffs, they require no maintenance properly vaping away remaining liquid when changing flavors, but can still be simply washed with lukewarm water if needed. Having the 3-piece design is a little more complex for the everyday user, but it provides a much better performing atomizer than the single use disposable cartomizer units while also saving money on cartridge replacements as you are no longer paying for a disposable atomizer each time. The one thing Prosmoke prides themselves on is quality. Everything is designed and fabricated at their Chicago headquarters facility. Boasting their certified green facilities, they are on the right path to setting high standards for quality and safety. ProSmoke’s various U.S. certifications ensures the buyer they are getting the safest product possible. In terms of vapour production, ProSmoke get a higher rating and performs considerably better than what they do with their flavors. In spite of their mini size, they are able to offer a satisfying cloud of vapour. The company uses top grade Vegetable Glycerine, which many consider to be safer than Propylene Glycol. Still, the throat hit may not be strong enough for heavy smokers, meaning that ProSmoke may not be the right option if what you want is an intense experience. I personally enjoy an all VG mixture over a PG and VG mix e-liquid, although the sweetness can skew flavors a little bit, after being a long-time smoker, I have grown to prefer a softer throat hit after some time. Many companies claim to have the #1 product, and ProSmoke is one of them, but when put to the test, battery life with ProSmoke is comparable to most brands out there. 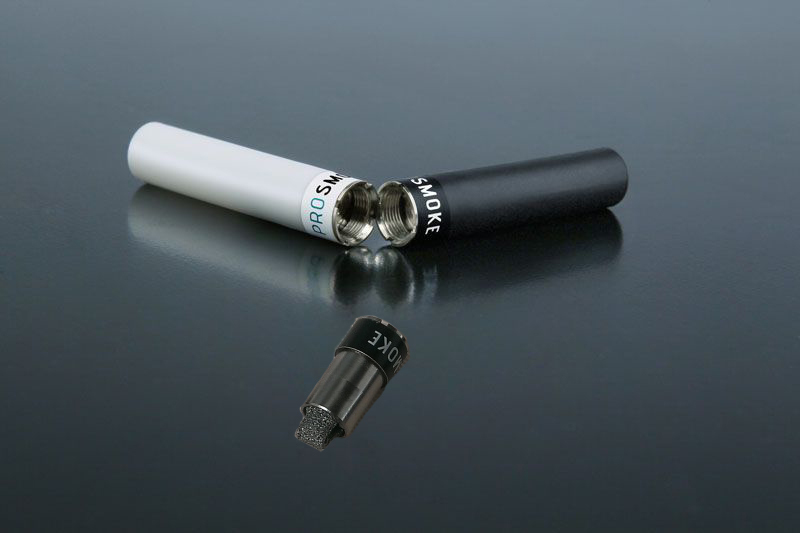 They offer a small sized light-weight lithium battery designed to look like a regular sized cigarette. We did not find them to last exceptionally long but with moderate use, we did manage to get 7 hours from it. Heavy vaping and long puffs make the battery last 2 to 3 hours, no better no worse than most top brands today. We do give it to them with the atomizer design being separate. Although it does not do much for battery life, it does extend the usage life overall and lowers the cost of re-fills. The accessory line features a notable portable charger designed like a pocket-sized pack of cigarettes. Able to carry 4 cartridges or atomizers, a fully assembled electronic ProSmoke cigarette and 1 extra battery. The case has a built-in battery that charges the ProSmoke e-cig with no wires. Prosmoke rates it capable of doing 5-10 charges but we have not got our hands on one yet to test it out ourselves. The case gets recharged with the help of a USB connector. We really love the design on these and consider them one of the potentially best portable chargers on the market, but would love to test them first to give you our final word. There is not a large selection of flavours and in some cases, they are too subtle, leaving users disappointed. 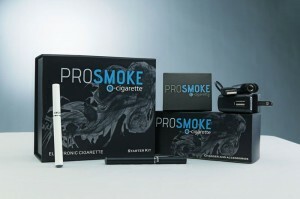 This is one area in which ProSmoke needs to step up their game, specially keeping in mind that there are so many companies that are constantly introducing new flavours and that are working to provide a richer taste and even providing tobacco blends that taste just like traditional cigarette brands. Some users have also complained about issues with juice leaking and cartridges that do not last as long as expected. The flavours available are Classic Tobacco, Menthol, Chocolate, Cherry, Apple, Coffee Jolt, Passion Fruit, Vanilla and a variety pack that includes a mix to allow you to choose your favourite one. Prosmoke offers 3 starter kits to keep things simple. With that you get a 30-day money back guarantee, if you are not satisfied with your purchase for any reason, you can return it for a full refund. Also very important is the 1 year warranty on hardware. Although limited on atomizers, we did have a battery that did not perform well after a few weeks and ProSmoke was kind enough to send us a new one. Their introductory kit is the ProSmoke starter kit which includes two long life lithium smart batteries (choose between black and white), one atomizer, five flavour cartridges of your chosen flavour and nicotine level, which according to the company claims, would last the equivalent to eight regular cigarette packages, one wall adapter, one USB charger and one box. All for $59.99. Their Super Starter Kit costs $99.99 and it contains two batteries, one atomizer, one convenient portable carrying case, twenty flavour cartridges, which are meant to last as long as 35 packs of traditional tobacco cigarettes, one USB charger, one wall adaptor and one cigarette box. To make your experience complete, choose their Deluxe Kit, that for a cost of $109.99, offers two batteries, one atomizer, one portable charging case, 20 long lasting flavour cartridges, one USB charger, one wall adapter and one e-cigarette box. Unfortunately, they do not offer express kits , which are a great option for new users and their prices are standard but there are other companies that offer cheaper options and better value for money. 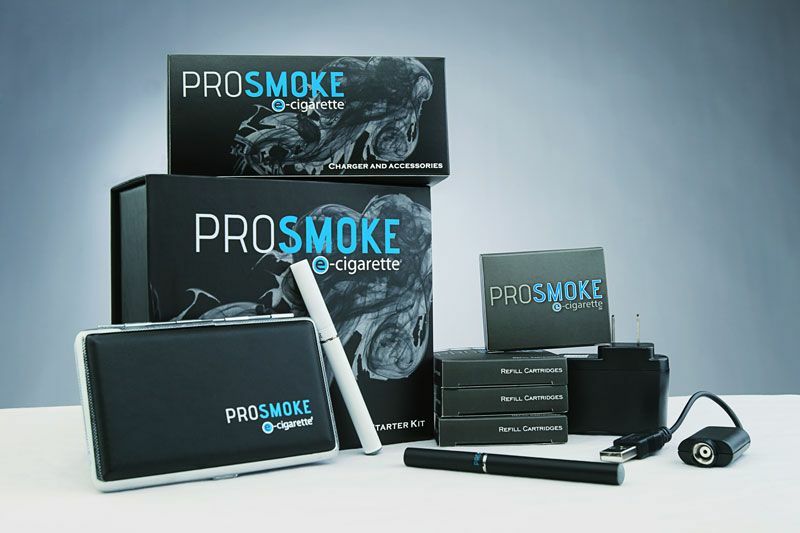 Also offered are ProSmoke Disposable E-Cigarettes, a great way for someone to try e-cigarettes for the first time with little monetary commitment, but also sometimes a good way to try a brand’s flavor line. Unfortunately, like many other brands, the disposable line only offers two flavors at the moment; Classic Tobacco and Magnificent Menthol. The ProSmoke disposable e-cigs are also fully certified by Green America. They advertise the cartomizer to last for about the equivalent of two packs of cigarettes and are designed with a soft tip and filter to give you a realistic cigarette experience in vapor format. 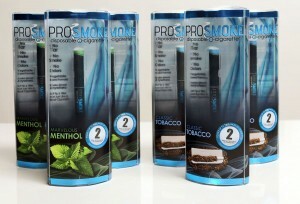 Learn more at our full Prosmoke Disposables review. The highlights for ProSmoke are the company ethics and their commitment to be part of the solution when it comes to care for the environment and contribute towards the research on cancer. The design of their product has a lot of quality and their vapour production is quite good but unfortunately, this is not reflected in the flavours, which can spoil the overall vaping experience. 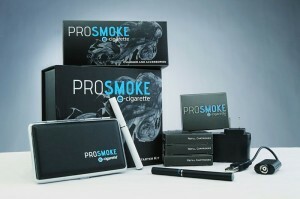 For those that are looking for solid vaping experience and that want to enjoy a rich flavour, ProSmoke may fall short. Still, it is an option worth considering for vapers that want a smooth and enjoyable e-cigarette.